The pink diamond and known as the "Pink Star" valued at over 60 million dólaressaldrá for sale in the auction house Sotheby's in Geneva. The Gemological Institute of America (IGA ) awarded the highest rating in color and clarity , it is one of the diamonds that are chemically purer . Discovered in 1999 in Africa, the rough diamond weighed just over 120 carats , was cut and polished in a workshop for two years to reach the beautiful 60 carat gem it is today. The Pink Star is the largest diamond with these characteristics has been offered. Before it goes on sale , the Pink Star will be exhibited in Hong Kong , New York , London and Zurich. 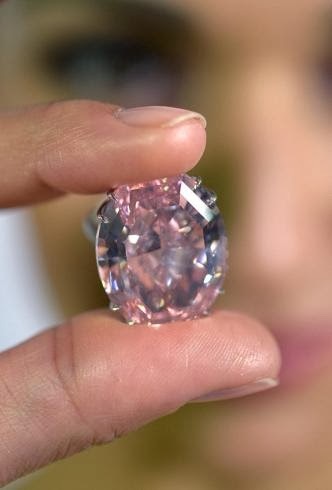 Although diamonds were auctioned several million dollars because of all its features , it will surpass the world record , set by the " Graff Pink ," a twice smaller diamond and with a cost of 46 million dollars.